We are a HUGE Stonyfield Yogurt household - it is the only yogurt that my boys have ever had. My 2 year old twins love their YoBaby Yogurt (I usually get the ones with cereal mixed in. My 4 year old has moved onto YoKids, which he loves. You can always find one in his lunchbox. In July, Stonyfield launched there new YoBaby Yogurt: YoBaby Meals. So what are YoBaby Meals? They are a 3-in-1 combination of yogurt + fruit + veggie purée for babies and toddlers. Each cup provides more than a 1/3rd of your toddler’s daily protein & calcium needs, plus other essential nutrients like Zinc, Vitamin A and Vitamin D. YoBaby Meals comes in 3 varieties: Pear & Green Bean, Peach & Squash and Apple & Sweet Potato. At the moment they can be found in only Natural Food stores. Stonyfield was generous enough to send me some coupons for YoBaby Meals so I could try them out. Unfortunately, one of the disadvantages to living in The Middle of Nowhere, New England is that there is only one small natural food store near me. Just my luck, they did not have them. So my search is still on to find YoBaby Meals. When I do, I will definitely report back to you all to let you know how my twins like them. 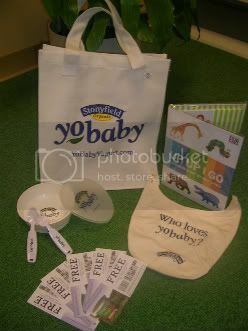 Stonyfield Farm is awarding one lucky reader with a YoBaby Gift Pack which includes a reusable YoBaby Bag, an Eric Carl Growth Chart, a YoBaby travel bowl with lid and utensils, an organic YoBaby bib, and a bundle of 5 Free YoBaby coupons. How cool is that! Visit Stonyfield Farm and tell me something that you learned about the company and what other products of theirs you like. You must complete this entry before you can submit additional ones. - Blog about this giveaway with a link to Green Mama's Pad and Stonyfield Farm. Please leave link in comment. - Follow GreenMamasPad and Stonyfield Farm on Twitter and and tweet this giveaway. You can tweet once daily. Leave link to tweet in comment. This giveaway is open to US Residents 18+ only and will end on Monday, August 17th at 11:59pm EST. One winner will be chosen at random using Random.org. Winner has 48 hours to claim his/her prize otherwise a new winner will be picked. You must leave your e-mail address in all of your comment(s) so I can contact you. I will not share your e-mail address with anyone, it will strictly be used to notify you if you win. Good luck! and i also like their smoothies! I am so excited! Angie loves yobaby!! I love the idea of having everything already mixed. I had never been to the website - I like the recipe page! I think Shoprite has this, according to the locator on the site. I'll look for it this week! I learned that: We got our start as an organic farming school, which means we’ve been caring for the planet for longer than we’ve been making yogurt. Today, our organic ingredient purchases help to keep over 100,000 farm acres free of toxic, persistent pesticides and chemical fertilizers known to contaminate soil, rivers, and drinking water. Also, their organic ice cream looks really good. I love the taste of organic ice cream! I learned that they have recipies and coupons!!! That makes me really happy!!! They use no preservatives or artificial flavors, colors, and sweeteners. I also like their organic Greek yogurts. I learned that they are based out of NH! I had no idea they were local. Mya would love to try the yokids squeezers. I think I'll pick some up next shopping trip. I learned that they have an online shop where you can buy t-shirts and onesies (among other things)--really cute stuff. My favorite product that they sell is the O'Soy Soy Yogurt. I love the Vanilla and Peach flavors in the O'Soy. I learned that they don't use BPA in their packaging! I've got you on my blogroll! I learned that they use farm-fresh milk from family farms, and fruits that are hand picked to ensure that only the finest ones are used. And they’re prepared the same day they’re picked to retain the freshest flavor. Business has the power to change the world - and you have the power to change business. i started feeding my son yobaby when he was little b/c he was small for his age and you could get the whole milk, full fat stuff without extra sugar. can't wait to try the meals! "all natural and organic ingredients—never any preservatives or artificial flavors, colors, and sweeteners like other brands. And all of our organic ingredients are produced without the use of antibiotics, artificial growth hormones, chemical fertilizers, and toxic and persistent pesticides." We love Stonyfield Farm, and my son is a big fan of their yogurt and cereal blends. We like them too, and usually sneak a bite! I also like their chocolate yogurt. I love that their company uses no hormones/antibiotics or pesticides. 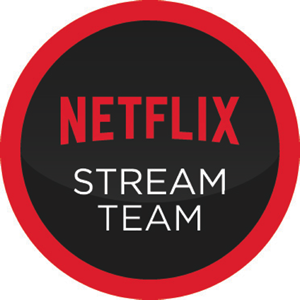 They're really such a great company and I wish that there were many others like them. I have your button on my blog, and you're on my blogroll! I learned: To help reduce global warming, we offset all of the C02 emissions from our facility energy use. We also started a nonprofit called “Climate Counts” which shows people how they can help fight climate change by the way they shop and invest. I like their Organic Strawberry Smoothie. And I hope I win! Love Yobaby. It's all G eats, too. I'm already following you on my reader! Check. And now I'm following you and SFF on Twitter! And I'm still learning Twitter so I have no idea how to C&P the link to my tweet? Anyone help? And now I'm a FB fan! I learned about the 3 categories that the USDA allows for oraganic labeling. I just tweeted & am following you. Following you in my google reader. Dude, I didn't know SF's products were Kosher! They developed the recipe in 1978! And my son loves the yogurt so I would love to try the meals too. I'll have to look for them in the stores. I think he'd love the apple and sweet potato! mmm they have raspberry lemonade yogurt! We love YoBaby yogurt! Thanks for the giveaway! I already love their products! Glad to know they rotate the crops so the soil is not depleted and don't use pesticides. Greetings. I learned they use farm-fresh milk from family farms, and fruits that are hand picked to ensure that only the finest ones are used. Excellent! I love their Vanilla organic smoothies. Yum! They started as a farm, and still take the custodianship of the earth very seriously when making business decisions. My daughter likes YoBaby for lunch. Her favorite flavor is Apple. I like it too, it's great as a dip for fruit. My first born and I love their yogurt. I loved the yobaby. I can't wait to go shopping and finally get to buy some for my 9 mts. old. I love the idea that they use renewable energy (wind,etc) to power their plants and make their products. Organic ingredients and envi-friendly. Wonderful!!!! I learned that At Stonyfield Farm, we use a simple recipe with only all natural and organic ingredients—never any preservatives or artificial flavors, colors, and sweeteners like other brands. I also like the smoothies. I learned that Greek yogurt is creamier than regular yogurt. Organic Yogurt Smoothies, and Organic frozen Yogurt pint- Gotta have vanilla. I learned that all their organic ingredients are produced without the use of antibiotics, artificial growth hormones, chemical fertilizers, and toxic and persistent pesticides. YoBaby Yogurt is my daughter's favorite. They add six live active cultures to our yogurts to help keep you naturally balanced. Our exclusive probiotic culture blend, including L. rhamnosus, enhances digestion and strengthens your immune system. I had no idea yobaby made anything other than yogurt, lol. The only yobaby products carried at my local grocery store is the yogurt, which my son LOVES, btw. I would like to try the organic ice cream and frozen yogurt. That sounds yummy! They use no preservatives or artificial flavors, colors, and sweeteners everything they use is all natural. I learned they don't use any preservatives or artificial flavors, colors, and sweeteners. And their new raspberry lemonade yogurt sounds DELISH! Stonyfield Farms is featured in the documentary "Food, Inc". i really like thier smoothies, i learned that they are featured in a documentaly food inc. THEY got their start as an organic farming school, which means we’ve been caring for the planet for longer than we’ve been making yogurt. Today, our organic ingredient purchases help to keep over 100,000 farm acres free of toxic, persistent pesticides and chemical fertilizers known to contaminate soil, rivers, and drinking water. I'prohibits the use of genetically modified organisms (GMO’s). I'd like to try Banilla Yogurt. I follow you and Stonyfield on Twitter and I tweeted. I like their yogurt with cereal.